Cliff Cheng, Ph.D., AC6C (formerly WN6JPA, WA6JPA, KI6CM, WW6CC). (JB, 1975). You changed my life. Next to my parents you were the strongest influence on my life. I watched you and learned as you tireless helped others. You always had time and a kind word for everyone. You spent a lot of time with others and myself and gave us lots of encouragement. By becoming a ham at a young age, it helped develop my confidence to go into the world and get good things done. It is remarkable that you created a whole amateur radio subculture around you at JB. You offered perhaps the best education in the history of ham radio. You gave us a solid foundation in electric shop and advanced electric shop. Then you taught us Novice and General classes. You had us out to your house on Saturday mornings to tutor us. After school we were operating our club station at JB and doing projects and learning. Not only did you license thousands you helped people get on the air. When they did have money for a station you fixed up jubky old boat anchor radios and gave it to them. 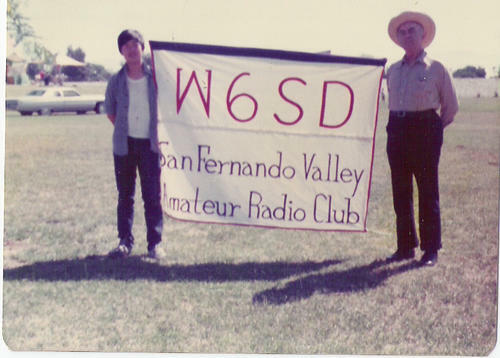 Your club, the San Fernando Valley Amateur Radio Club, W6SD had essentially adopted us. This was way ahead of the adopt-a-school programs. Club members were always there to support us. You took us on field day with W6SD. What we did not have in our club, your club provided, in not just techicical expertise but here were 200 people who we could watch, listen and learn with. And we had great fun doing this! Ham radio taught me about different peoples and different cultures. Through amateur radio you taught me to help others. I am still involved in emergency communications. There is so much to say that I probably have expressed this better and in more detail on my personal ham webpage in which your positive influence in my life is a constant theme www.WW6CC.4t.com and on the website my experiences as a novice in your electric shop inspired me to start - Novice Historical Society - www.Novice.bappy.com.